Professional basketball is a serious sport in Cyprus – and PENETRON crystalline technology is an equally serious solution for concrete durability. For the new ENAD Stadium in Nicosia, the project engineers opted for a professional answer to a high water table situation: the PENETRON System. Construction challenge: Very high groundwater levels confronted the ENAD Stadium builder. 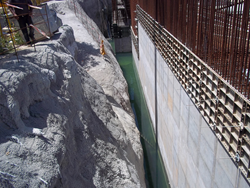 The concrete walls were treated with PENETRON ADMIX to ensure impermeability. Soon after the treated concrete was poured, we saw that the basement structure was safe and dry. We’re looking forward to the inaugural tip-off of the ENAD team – it promises to be a great season! Similar to the U.S.A., basketball is played avidly throughout the Mediterranean region of Southern Europe. The ENAD Stadium is the new home to the Enosis Neon Agiou Dometiou (ENAD = Union of Youth of Agios Dometios), a first division basketball team based in Nicosia, Cyprus. In addition to basketball, the ENAD organization also runs soccer, table tennis and volleyball sports programs. the club is best known, however, for its championship basketball team. The new stadium seats 3,000 on a footprint of about 4,000 m2 (43,100 square feet). This modern sports facility features basketball, volleyball, handball and futsal courts at the ground level, and a fitness gym, wrestling area and two squash courts in the basement. “During the initial excavation of the construction site, the building crew was confronted with a very high groundwater level – about 3-5 meters of water! – that hampered any below-grade construction,” says Theodor Mentzikofakis, General Director of PENETRON Hellas. The project engineers then decided to use PENETRON crystalline technology to ensure a permanent and absolutely waterproof concrete structure. Initial repairs to the concrete were done with PENETRON crystalline topical material and PENECRETE MORTAR to seal any cracks and leaks. PENETRON ADMIX was used to treat all the concrete in the base slab and the walls. PENEBAR SW waterstop strips (and PENEBAR PRIMER) were used to permanently seal all the construction joints in the new concrete. Getting started: The 4,000 m2 footprint of the new ENAD Stadium rests on a base slab and walls treated with PENETRON technology for an absolutely waterproof concrete structure.